Yes, this is indeed the finest volume of the Holy Scriptures that I’ve had the privelege of owning. All is nice; except the book names at the top, I think, Really need to be larger and bolder. Otherwise, beautiful in every way! Thank you. Very nice bible. The cover is soft and supple. The 36 gsm paper does well to minimize ghosting, and when coupled with the line-matching, ghosting is not an issue at all. The layout of the text block’s pages is very classy. The font is crisp, and easy to read. 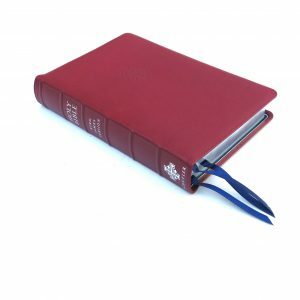 Also, although the binding has the hinge support, the bible – due to its supple cover – lays nicely open. Very happy with my purchase. Some may want to compare this to the Allan Longprimer. The latest version of the Longprimer is also very nice. 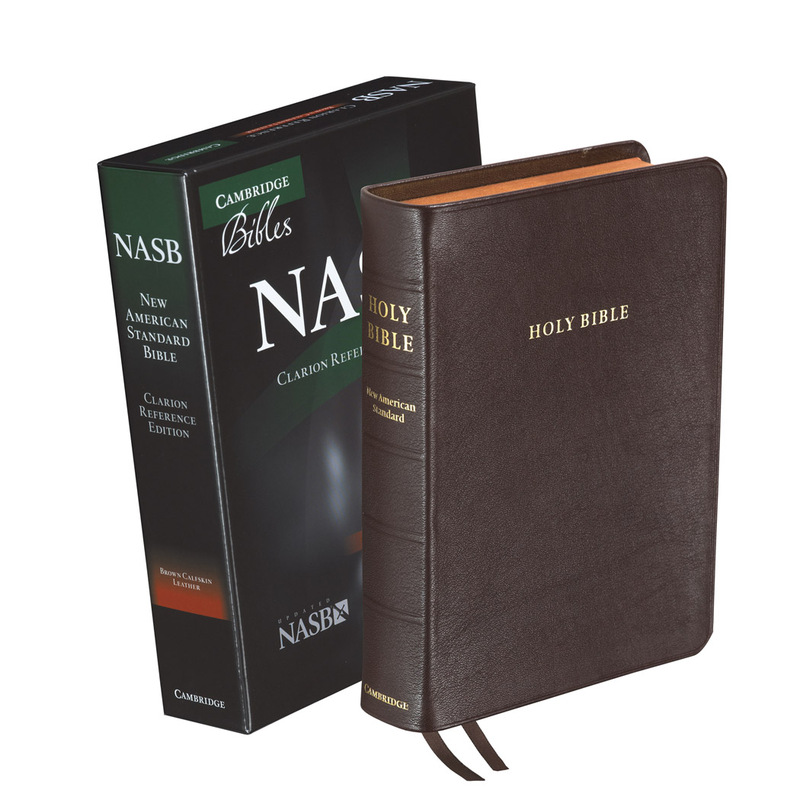 Anyone purchasing either of these KJV bibles should find satisfaction. 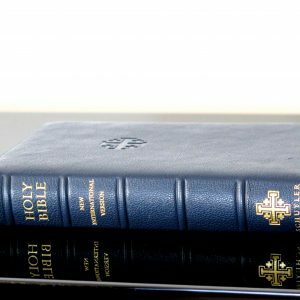 The two bibles are both excellent, just in different ways. 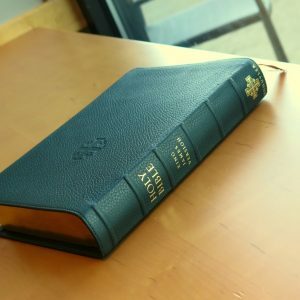 Got my new Schuyler brown goatskin Bible (in time for Christmas!) 2016, and I’m “tickled Gray” so far with it!!! It’s an awesome feel, ‘grayt’ print, very good resource helps, etc. I could not be happier with it so far! You just cannot go wrong with a copy–or more. 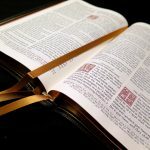 As a minister I have numerous translations, and (using the biblical texts as is) I find in them a lots to add to my study. But [this] copy (the Canterbury KJV) is ‘just tops’ for me! I couldn’t be more pleased, not at all!!! This Bible is a work of art. The drop caps, which are stunning, perfectly compliment the beauty of the King James prose. The text block is a delight to read; crystal clear and beautifully laid out. The paper is a slightly creamy colour which is soft on the eyes. The font size is perfect, and makes for easy reading. The workmanship is exquisite. I love the perimeter stitching, and the pages open perfectly – no sticking. 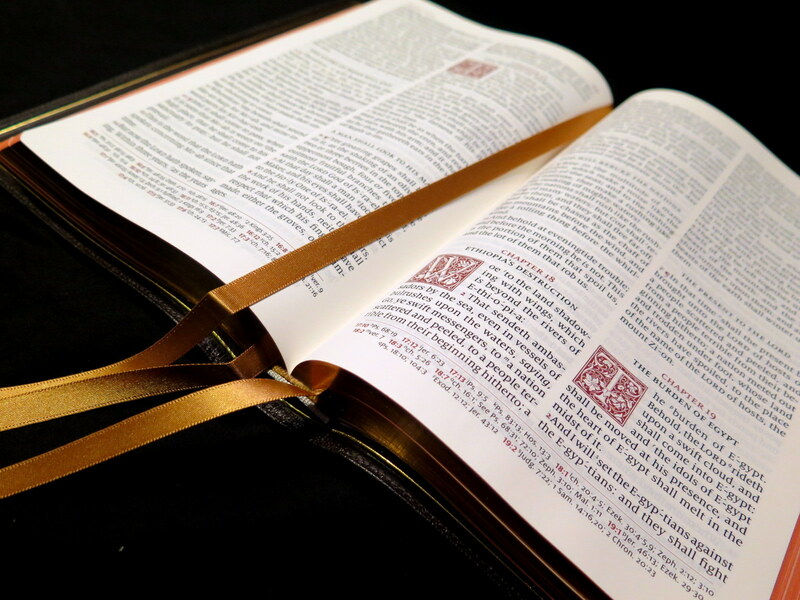 I find the Bible easy to hold in the hand; it opens flat; no problem with the hinge. The art gilding is beautiful and the leather flexible and gorgeous. The King James glossary that is included makes it so easy to look up any word you don’t understand. 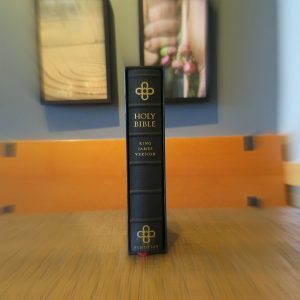 This Bible is an absolute masterpiece; Schuyler have excelled themselves, and I am so grateful to evangelicalbible.com for distributing it. 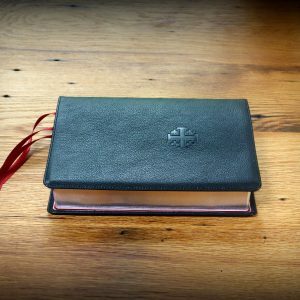 Here in Australia there really is no where to get a premium Bible. I came across Schuyler quite by accident and based on a couple of YouTube videos decided to buy it. I have never seen such a beautiful Bible. 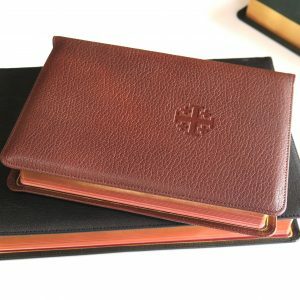 The leather is soft and luxurious, the gilding is perfect and the type face with drop caps is just fantastic! 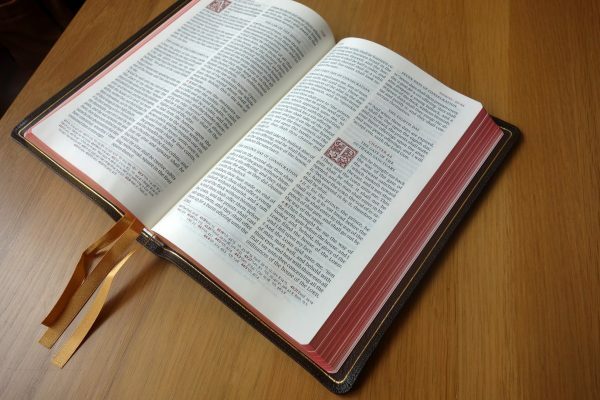 This Bible truly is beautiful, a real masterpiece. In fact it is so beautiful I just can’t put it down. I really do enjoy my new Bible. Thank you so much. I’ve owned the blue & the black Canterbury. 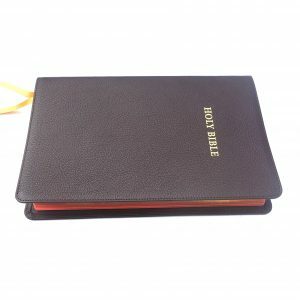 I sold the blue and have shelved the black because this brown one is my favorite color for a bible (I will pull out the black around Christmas because of its red liner). While not as stunning as the others I mentioned, the brown is elegant and calming. This particular edition is the best of Schuyler’s craftsmanship – on full display. Simply flawless. The paper is the best in the business, and the book block is a masterpiece. It’s a joy to read. An absolute work of art! Goatskin is so supple, it almost has a “sponginess” to it. Lays flat when open, very easy to read with it being a large print. Honey colored ribbons match well with the dark brown color. Easily Schuyler’s best! I have never held or ready a finer bible. This is still the best bible that I have owned. And it has moved up past my brick!!! – at least for now. This bible will continue to grow on you the more you use it. It forces me to slow down, and relax while reading. My mom got this Canterbury for me and I am seriously amped. I love the KJV exclusively, and this Canterbury is beautiful with a muted elegance all it’s own. 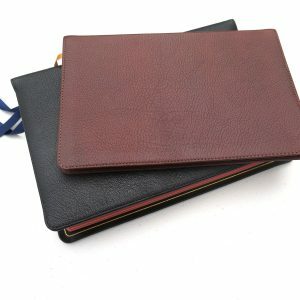 The dark brown goatskin is ultra-soft and pliable and is just the perfect shade to compliment the golden placemarker ribbons, gold over red page edges, the silky cream pages themselves, and the muted red drop caps. Just perfect. Just beautiful. I actually thought about ordering ANOTHER one just like this, haha, just to have a copy that remains pristine. There’s something about this that makes you turn the pages reverently, and I think that’s nice since the KJV contains something to be revered. The maps are really cool, with topolographical rendering (well, they show relief), and everything just feels right about this edition, down to the King’s English dictionary and concordance. Compare this edition’s textblock with ANY other and you’ll find nothing like the Canterbury, because it’s clean and clear, with perfect font size and spacing, uncluttered and simply a joy to read. If you’re thinking about getting one of these, DO SO, before they run out. I can see this Canterbury being valuable in the long run. 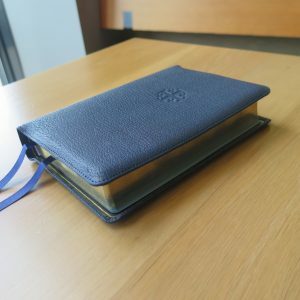 But I’d never get rid of mine – the little card you receive with the Bible calls this an “heirloom Bible”, and I think that’s a fitting description, something to pass on to one’s descendants. All I can add to these wonderful reviews that sold me (along with the photos) is that the five star reviews are not hyperbole – this dark brown Canterbury is truly comforting because of its subdued elegance, the warm muted tones that harmonize for the eyes, while the tactile quality of the goatskin is unmatched (one reviewer said “spongy” and that’s so true). The paper’s color is creamy rather than bright, and it really shows under soft lighting. I looked at Allen Longprimers but Schuyler Canterburys are unmatched aesthetically because of their unique textbook – the cross-referencing is kept at the bottom of the page, unassuming, leaving just a beautiful page with very unique drop caps unlike any other publisher. Very worth the money. 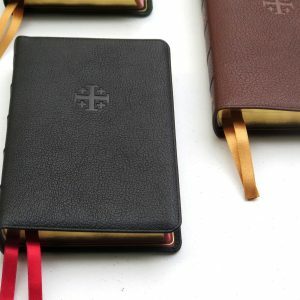 I’ve put the black personal size Canterbury on my wishlist, because I love these Canterburys and can see the beauty of the stately black edition as well. 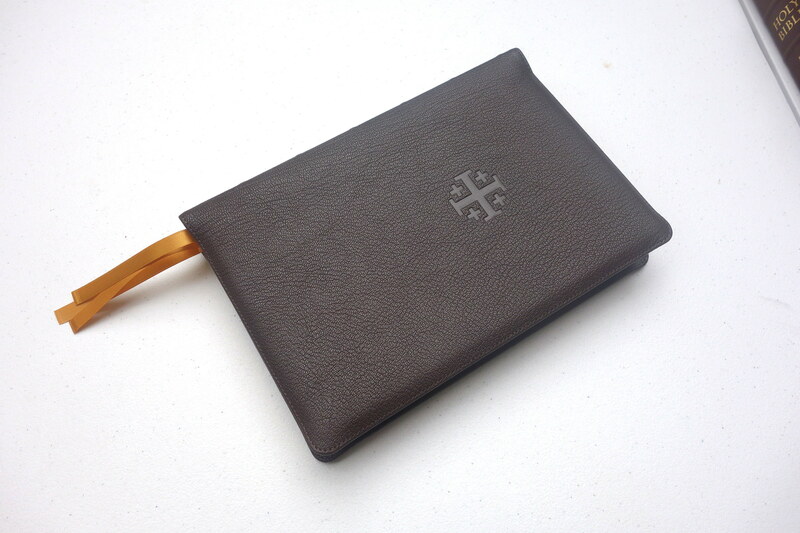 But nothing beats this brown, in my opinion, because it has the feel of a modern codex. The red and blue full size Canterburys are gone now, so I’d recommend grabbing these while you can! You won’t regret it! I have had many Allan Bible and Cambridge. This my first Schuyler and I am More than impressed I am blown away!!!! I first bought my brother a Schuyler for his birthday and seeing the quality of Schuyler I just couldn’t resist. 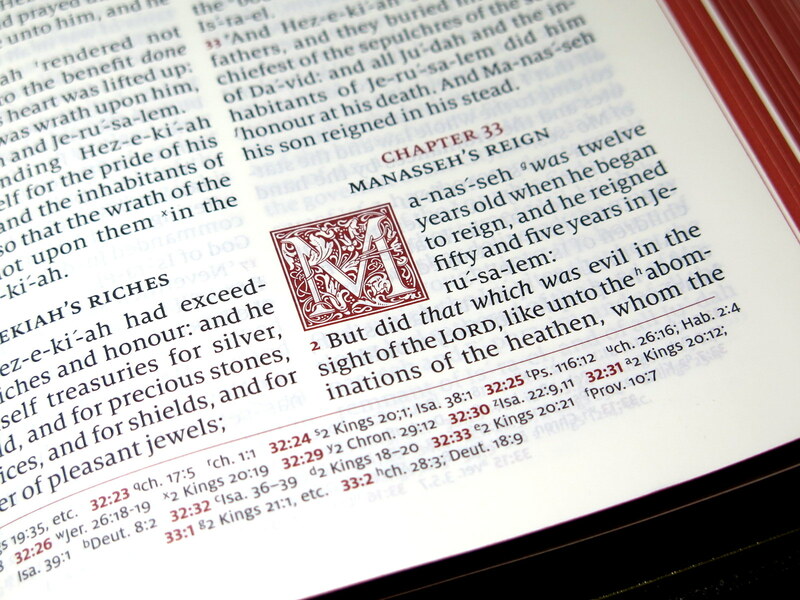 The type setting is amazing this is the most readable Bible I have ever used and I have had the very best! 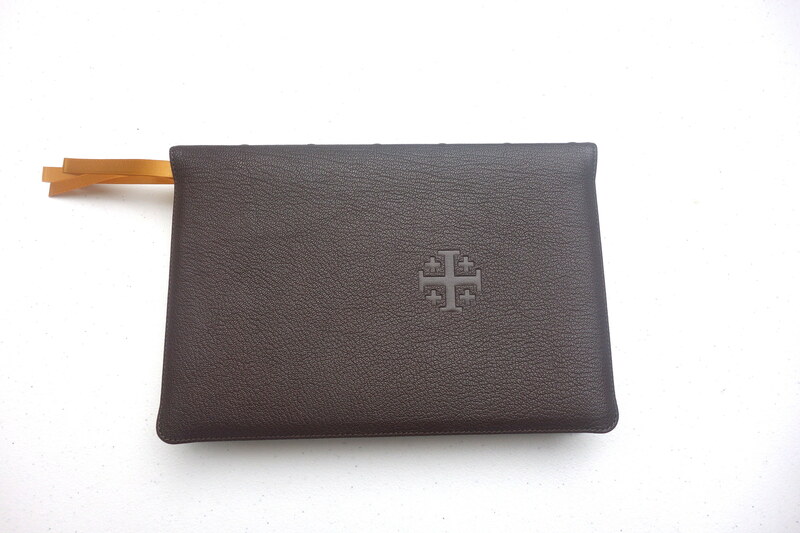 The service as always is excellent and the cover and binding are perfect! Thanks EV Bible for putting out such a tremendous edition, God bless!! This version of God’s word transcends all other Bibles ever made. 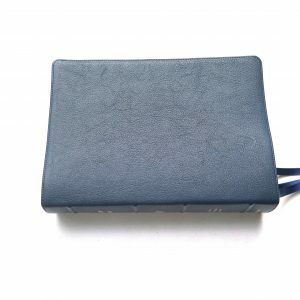 The plush goatskin leather opens up to one of the smoothest papers ever used to showcase with great clarity the modern and very readable Milo font of point 11. The kerning and letter-spacing of each verse is well crafted to allow a comfortable read at an arms distance. The simple and sophistication of the print format with double columns and generous margins is second to none. The weight of 4lbs. is deceivingly lighter than imagined. The books ergonomic spine places itself comfortably in either palm as the pages drape over your hand with just enough firmness to read without difficulty. 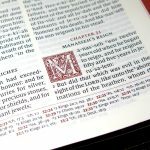 The concordance could be more extensive but what they have works well for most readers studying the word while the King’s English dictionary is quite helpful. It’s both eloquent in design and practical in function. I own the R.L. Allan 62 Sovereign and the 2018 edition of the Cambridge Turquoise yet this gorgeous Bible from Schuyler has to be my absolute favorite. It sets the bar for quality very high. Truly a benchmark of a high premium Bible. Get this one! Beautiful Bible I just wish it had the words of Jesus in red letter. I have two R.L. Allan Longprimers and they are very comparable. I like how the Canterbury breaks up the chapters into stories. R.L. Allan doesnt do that. Great Bible a definite must have!! !